Hallelujah Lulie reflects on Matthew d’Ancona’s recent public lecture at LSE where he discussed his new book Post Truth: The New War on Truth and How we Fight Back. Listen to the podcast. How did the anti-establishment and anti-status quo movement end up as anti-truth? It made it into the mainstream so fast that by the time it was named the Oxford Dictionary’s word of the year 2016, ‘post-truth’ had already become a cliché. The rise of the populist right and xenophobia in Europe, the platform on which the leave campaign of the EU referendum was run, and the election of Donald Trump all played a part in helping the word gain its current level of prominence and notoriety. The concern is that beyond being the word of the year for 2016 and the political buzzword of the moment, post truth could be the spirit of the coming decade. Lies being regarded as the norm is the essence of the post truth world. 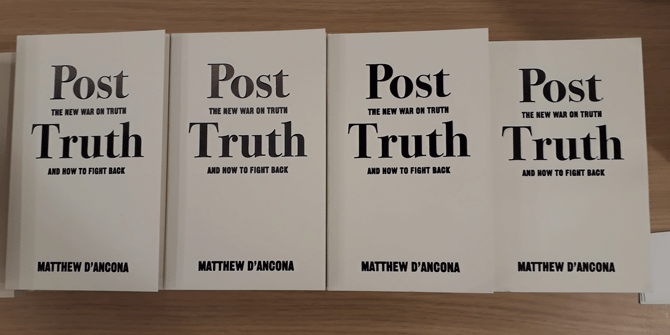 Matthew d’Ancona, Guardian columnist and author of new book Post Truth: The New War on Truth and How we Fight Back, stated during his public lecture at LSE that ‘it isn’t about the lie, it is how we respond to it. It isn’t about them. It is about us.’ Post truth goes beyond the age-old act of lying itself; it is about the lifespan and impact of the lies. D’Ancona acknowledged the abuse of both post-truth, and its linguistic partner- fake news, with the two frequently being deployed as crude weapons to bat away opposition or scrutiny. In his lecture at LSE, D’Ancona outlined how populism and demand based manufacturing of truths laid the ground work for the post truth world. In the struggle against the status quo, the truth now appears to be represented by the establishment. The war on political correctness turned the war on the nature of correctness itself. This battle was not just about the political right, but was adopted by groups and individuals from across the political spectrum. In the war on truth being racist, xenophobic, misogynist and homophobic was labelled as ‘telling it as it is.’ Lies stopped having consequences. They were forgiven, contextualised, underplayed and rewarded. Internal inconsistency, and being unapologetic and unrepentant for telling proven lies became a sign of strength. Facts became seen as dry and as Arron Banks, prominent UKIP donor and one of the architects of the leave campaign stated, ‘Facts don’t work’ for winning votes. He went on to say that, ‘the remain campaign featured fact, fact, fact, fact, fact. It just doesn’t work. You have got to connect with people emotionally. It’s the Trump success.’ Both Donald Trump and those campaigning for Britain to leave the EU had a simplicity and emotional resonance with voters. Empiricism and statistics began to lose their value as being different was much more important than being right. It is a license to pick or create own truth without verification. Kellyanne Conway’s ‘alternative facts’ where one choose their own reality from a buffet of ‘alternatives’ embodies the spirit of the era. For Conway, falsehood was the antonym of truth no more. D’Ancona agrees that during the EU Referendum campaign voters were bombarded with ‘intellectually defensible but emotionally un-relatable’ statistics for employment, trade and the economy. They are technical and abstract, and at times condescending numbers that do not speak to the ordinary experience of the individual. The departure between D’Ancona and Banks is that the former is calling for ‘wrapping facts with emotional resonance’, while the latter is not concerned about facts at all. Will there be a post post-truth? In the dialectical scheme of things one may assume this is a temporary state of affairs, and the question could be how long will this post truth era last? Many, d’Ancona included, are skeptical of a natural and smooth process or way out of the post truth world. D’Ancona’s book claims that overcoming the post post truth world won’t be the natural turn of events. The return to the era of reason, or whatever preceded the post truth world or whatever emerges out of it demands a coordinated response. Initiatives such as scrutinising claims, fact checking, and litigation could be good start, but they do not have the strength to turn the post truth tide. For d’Ancona a systemic and structural response is needed, such as the inclusion of digital literacy in schools with the aim of creating citizen journalists and editors. Efforts by the tech giants of Google, Facebook and Twitter to filter fake news need to be scaled up, both in terms of commitment and technology. D’Ancona stated that the battle against post truth cannot be won by facts alone. Research has shown that the more you provide people with proven facts to convince them of particular point of view, the more they turn away from them. An increase in facts could mean more resistance and rejection of these given facts. D’Ancona concludes by saying that facts must speak to experience, memory and hope. Therefore the key to combating post truth may lie in appealing both to the emotional and the rational. Hallelujah Lulie is an MSc Comparative Politics student in the LSE Department of Government specialising in Nationalism and Ethnic Politics. 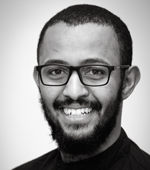 He is interested in democratisation, nationalism, security and social movements in the Horn of Africa, & the African Union.